TPR was ordered to leave a public meeting of the Property Standards Committee today after the City Hall objected to the use of Twitter in the public gallery. The Public Record was ordered to leave a public meeting of the Property Standards Committee today after the City Hall objected to the use of Twitter in the public gallery. The City says the use of a "electronic device" by a member of the public to post to Twitter constitutes "broadcasting" and is forbidden under new rules. The rules are not publicly available on the City website. Robert Miles is a public figure in Hamilton, a Realtor and manager for one of largest property owners in the downtown. The Gore Buildings are located along the main downtown strip of the City, and are of significant public interest. Coverage of this public meeting is clearly in the public interest, and protected journalistic activity under the Charter of Rights and Freedoms. Hamilton City Clerk Rose Caterini, who directly reports to City Manager Chris Murray, implemented new rules for various committees at City Hall to address Council concerns regarding "eavesdropping" during public meeting. By "eavesdropping", the City is referring to the recording of public proceedings and posting of full videos of those proceedings. The new rules state "broadcasting" is only allowed for "the purposes of education or news dissemination". The rules do not define "broadcasting" or what is "education or news dissemination". More recently, some City Councillors and the Mayor have taken to calling The Public Record a fake news site. As I am no longer considered media, City Council takes the position that my use of Twitter is "broadcasting" and not "education or news dissemination". It was also shortly after the Divisional Court ruled that The Public Record video of another Election Compliance Audit Committee could be entered as evidence in a court proceeding and may supersede Council's version of events in the minutes where they conflict. Property Standards Committee is an open meeting under the Municipal Act. The City takes the position that because the Property Standards Committee exists under both the Property Standards Act and Municipal Act, the City can ban non-media from recording/broadcasting these public meetings under the Property Standards Act. The City is not imposing any restrictions on City-approved media outlets, the ban only applies to members of the public. 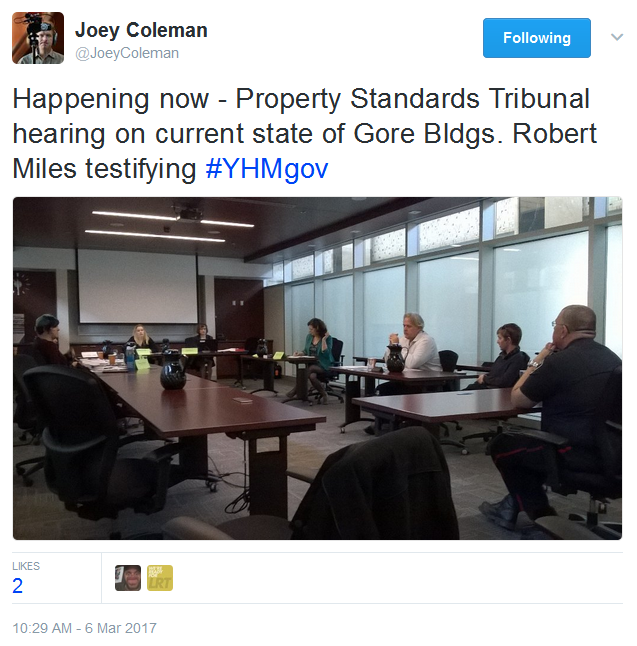 The Committee met today debate property standards bylaw orders for 1 St. James Place, and the Gore buildings. The meeting was scheduled at the same time as a Council meeting on the City's proposed Transgender and Gender Non-Conforming Policy. I was in Council Chambers for the beginning of the Council meeting, and walked over to the public committee room for Property Standards around 10:25 a.m., to grab a copy of the agenda (the City does not post public committee agendas to its website). As I entered, the developer's agent was making good points about the absurdity of the City requesting he install plywood to cover upper level windows when Council has approved the demolition of the building. As I was filming Council, my camera remained in the other room - Council Chambers. I came into the public meeting room without any gear, I was not even wearing a jacket to hide anything. I only had my cellphone in hand. As I sat down in the public gallery, the Clerk assigned to the Committee by the City Manager's Office took note of my arrival. I began tweeting. The City Manager's communications team keeps close tabs on my movements at City Hall, and within moments of my tweeting, the Clerk stopped the meeting. The City Manager's solicitor in the room demanded to know if I was engaged in "broadcasting" and "recording" with any devices not visible to the committee. I refused to answer initial question. The demand was repeated. I responded, while remaining seating "I'm engaged in journalistic activity which is protected by Section 2(b) of the Charter as Freedom of Expression" and that "I will not be entertaining your questions because City Council does not authority to stop my journalistic activities protected by the Charter". The Clerk informed me that I had to request permission at the beginning of the meeting, and I was in violation of City policy because I arrived late - disrupting the meeting. Putting aside, two meetings starting at the same time, Council is particularly annoyed about recording votes and attendance at meetings, less than a third of City Hall meetings start on time due to a lack of quorum as Councillors usually arrive late. One Councillor recently spent hours ranting on Twitter after I noted his arrival times at meetings during one day. The City Manager's Office stopped the meeting due to my "disruptive behaviour", emptied the room, and the Committee went into closed session to deal with the "disruption". I returned to the Council Chamber to grab my notebook, and to process two video clips of the important discussion occurring about the City's Transgender Policy. After about 20 minutes later, I returned to the meeting which had resumed in public session. Upon my sitting down, the meeting immediately stopped, and the City Manager's Office informed me that I was to power down my cellphone, and remove the battery, as the use of Twitter was "broadcasting" to the Internet. I continued tweeting, ignoring the City Manager's solicitor's demands for me to turn off all electronic devices and to confirm I had done so. The City Manager's solicitor then advised the Committee they had the right to demand my removal, which the Committee did as suggested. At which point, I was told that I was "disruptive" to the meeting and was ordered to leave the room, which is enacting The Trespass to Property Act. I refused to move from the public gallery. At which point, the City's solicitor advised the Committee to adjourn the meeting to be rescheduled for a future date. I told the City's solicitor that I would voluntarily comply provided the City issue a written notice of removal. The City Manager's clerk stated they would, and I left. My decision was based upon not wishing to see the second hearing cancelled, and the individual incur further legal fees due to the City's actions. I have consulted with the new City Solicitor, Nicole Auty. She was advised by her staff that the Committee did hear from an appellant who objected to being broadcasted and the Committee accepted his argument as meeting the criteria in the Broadcast policy. At which point I understand you were asked not to broadcast the meeting, but you were welcome to remain. I understand that staff explained the decision on the matter will reflect this - and will be shared with you. Staff also advised that you did not acknowledge the ruling of the Committee Chair on the Broadcast policy pursuant to powers under the Statutory Powers and Procedure Act, and as a result you were asked to leave the meeting. I was also advised there was no reference to issuing a Notice of Trespass nor are you banned from the Property Standards Committee. I hope this helps clarify, if you have any questions or points of clarity, please do let us know. The City Manager has not released its definition of broadcasting, beyond that members of the public using Twitter are in violation of whatever the definition is. The Property Standards Committee does not publicly post its decisions. Whatever rulings they made today will remain secret until minutes are published after their next meeting which will likely be on the same time as the May Council LRT meeting. The City's new City Solicitor started last week, arriving in Hamilton after leaving St. Catharines three months ago: City lawyer exits after IceDogs flap. Just another day at Hamilton City Hall. A version of this article was first published on The Public Record. You can help by emailing clerk@hamilton.ca and asking for a copy of the new public meetings "Broadcast Policy" and new definition of "Broadcasting" that forbids tweeting during public meetings. I do not know which is more absurd: The idea that a public meeting should not be publicly broadcast, or the idea that some bureaucrat thinks that he can decide who is and who is not "media." I seem to be getting the message that the only people who are entitled to know what goes on at public meetings are those who can afford to take a day off work and go to them. Or those who are retired, independently wealthy or otherwise do not have to work at all. But for us long-suffering masses, the business of the City will be conducted in secret. Joey, please accept my thanks for allowing a ray of sunshine in to what otherwise could be perceived as a cozy crony secret process. I am a member and vice-Chair of the Hamilton Cycling Committee. This is a citizen's advisory committee to City Council. We meet at City Hall on the first Wednesday of the month at 5:45 PM. This is a public meeting, open to the public. As far as I personally am concerned, Mr. Coleman is not only welcome but invited to broadcast in colour video our committee meetings. I wonder perhaps if it would be of benefit for some committees to go so far as to record their own meetings and either forward content to Joey or maintain their own server/youtube with Creative Commons. Obviously few would have the general resources for high quality content, but it would go a long way to creating open access to city meetings while we wait for City Hall to install their new systems they're promising. Subject to sections 2 through 8, a hearing before the Property Standards Committee (“Committee”) may not be recorded/broadcast unless prior permission has been given by the Committee. A statement will be read at the start of the meeting by the Committee indicating that this is the case. A recording/broadcast of a meeting may only be used for the purposes of education or news dissemination. Permission will not be given to record/broadcast hearings or portions of hearings that are closed in accordance with the Statutory Powers Procedure Act when members of the public and the media cannot attend. Parties may arrange, at their own expense, for the attendance of a qualified verbatim reporter for the purpose of recording all testimony and submissions during a hearing and preparing a transcript. Permission is not required for this, but the Committee should be informed in advance of the hearing so that the meeting room can be set up to accommodate the verbatim reporter. (e) the privacy interests of participants will be protected. In determining whether to permit a request made under section 5, the Chair of the Committee shall ask the parties and any witnesses whether any information of a personal nature may be disclosed. In addition, the Committee may hear submissions from any interested person. The Committee may permit a request made under section 5 subject to any conditions necessary to ensure the concerns raised under sections 5 and 6 are addressed. This may include limiting permission to only a part or parts of a hearing. The Committee may, at any time during a hearing, withdraw or limit their permission to record/broadcast, if the concerns raised under sections 5 or 6 are no longer addressed. Note item #2: "A recording/broadcast of a meeting may only be used for the purposes of education or news dissemination." The City has yet to explain three things: 1) its definition of "recording/broadcast of a meeting"; 2) its definition of "education or news dissemination"; and 3) how Coleman’s two tweets a) meet the first definition and b) violate the second. No, but understandable - most days at City Hall feel like a combination of Feb 2 and Apr 1. Dear god, what is going on inside that building? What kind of culture produces officials willing to waste their lives playing such games?! A meeting is public or it is not. Period. This petty pursuit of Mr Coleman is laying bare an appalling aversion to openness at city hall. Thanks for publishing those policy details, Ryan, I find this section especially galling/appalling: "broadcasting" MAY be allowed, provided "no participants, including the parties, will be negatively impacted (for example, an individual participating as a witness may be reluctant to testify or testify fully); and (e) the privacy interests of participants will be protected." This section represents such a crippled view of our public civic life (the baseline value at work is a notion that being "public" is bad or dangerous, instead of necessary and normal) that it really needs to be challenged. Does this policy include Whitehead and his tweeting during council/committee meetings? Obviously Joey is a target for many at City Hall? Joey, never challenge those who feel only they have the power! Becoming very disillusioned lately with the Mayor & several power bloated Councillors! I wish to share with you that I've made an offer to the City Manager's Office this afternoon in regards to the new "Broadcasting Policy". As stated by the City Solicitor publicly on Wednesday, the City has yet to create definitions in the policy. "broadcasting means any transmission of programs, whether or not encrypted, by radio waves or other means of telecommunication for reception by the public by means of broadcasting receiving apparatus, but does not include any such transmission of programs that is made solely for performance or display in a public place;"
"program means sounds or visual images, or a combination of sounds and visual images, that are intended to inform, enlighten or entertain, but does not include visual images, whether or not combined with sounds, that consist predominantly of alphanumeric text;"
4) The City adds language stating the public is allowed to use electronic devices for non-broadcasting as defined in the policy. I await your response by 12:00noon EST on Friday March 10.